When friends come to visit me here in France, it’s such a joy to watch them discover French cuisine in all its authentic glory. The cultural and culinary icons associated with France vary from country to country, but the most popular remain: the famed baguette, the sometimes misunderstood fromage, the mythic vin and our topic du jour, crêpes. I can usually do a proper introduction to the first three culinary delights for first-time visitors chez moi, at my place, but personally I believe that proper crêpe initiation must take place in a crêperie or crêpe restaurant. I think it’s safe to say that nearly every culinary tradition has its unique version of a thin flatbread, though I haven’t done any hard, journalistic research on the subject. In Mexico we find tortillas, First Nations tribes in North America propose multiple versions of flatbreads, Indian cuisine hosts naan and roti/chapati (and more! ), rice flour is used to create the thin paper we use to make various roll-ups in Asian cuisine, what Ethiopian meal would be complete without fresh injera… I really must stop listing the deliciousness now, I’m getting too hungry. It makes evolutionary sense that once humans made the connection between eating whole grains and having full tummies (and more energy to run from the saber-toothed tigers), that grinding the grains, thus making it a wee bit easier to chew, was the next step. And hey, those opposable thumbs came in mighty handy for mixing ground meal with water and cooking that thin batter into a flat bread. Hurrah for thumbs! 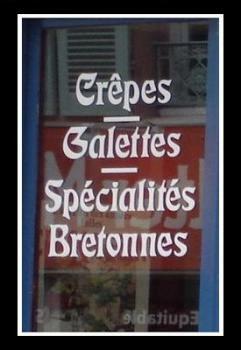 Enough about evolution, let’s get back to the crêperie, shall we? (Way more fun than running from tigers.) As far as regional specialities go, crêpes are considered a Breton tradition, meaning, coming from the area we call Brittany in northwestern France. 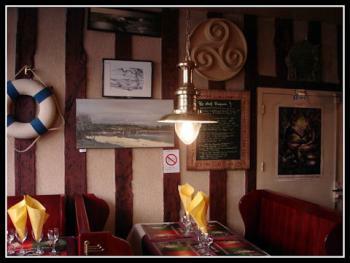 The décor you’ll find in many traditional crêperies is inspired by the Breton culture, and maritime themes abound, and you’ll often here Celtic music playing softly in the background. Some restaurant goers may dismiss this Celtic ambiance as a little over the top, but really, it’s part of the experience – sit back and enjoy! 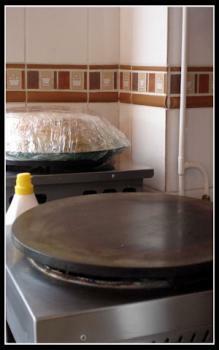 Here’s the interior of a typical crêperie. Notice the no smoking sign? Smoking is banned in all public establishments in France as of January, 2008. There are generally two things that surprise my « first-time » visiting friends about their meal at the crêperie : Surprise number 1 is we don’t drink wine with our meals, but cidre or hard cider . This is because Normandy, the region just to the north of Brittany, is one of the largest apple producing areas in France. Contrary to popular belief, wine isn’t produced everywhere in France (nor does it flow from our faucets, though that could be cool! 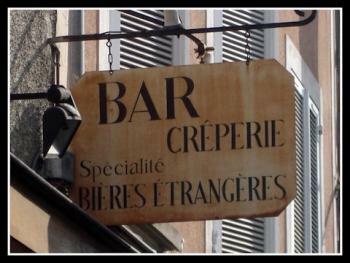 ), and since cider is a neighbouring speciality, crêpes and cider are a match made in (culinary) heaven. Another great way to get your crêpe fix is at one of the many walk-up vendors. This option is very popular with tourists and students as it’s a sort of an authentic French fast-food – fast, portable and relatively inexpensive. Your options are limited to the more basic crêpes such as ham and cheese or chocolate and banana, but « basic » never tasted so good! Photo of a walk-up crêperie’s professional skillet. Crêpes are considered what I would term « comfort food ». In the familial sense, they seem the be the socio-culinary equivalent of « Mac & Cheese » or pizza delivery in North America. Parents will often make crêpes for a fun week-end dinner for their kids, or as one of my friends jokes, « When maman isn’t home in time to make a proper dinner, papa makes crêpes. » When probing my husband on his childhood crêpe-eating habits, he says that crêpes were always synonymous with a holiday or some other special occasion. The ritual of the afternoon snack which we call the goûter or le quatre heures (because it’s usually around 4 p.m.) is an honored tradition here, and crêpes make an extra special weekend snack for children of all ages. There are, however, some specific fêtes where crêpes are the overwhelming choice: La fête de la Chandeleur and Mardi Gras. While Mardi Gras, or Fat Tuesday, is celebrated all over the world, La fête de la Chandeleur, which falls on February 2nd, is a lesser-known holiday. Etymologically speaking, la Chandeleur was once pronounced la Chandeleuse, coming from the French word chandelle or candle. The original Latin name, festa candelarum meant « feast of the candles ». This holiday began in the Pagan tradition, but was adopted by the Cathloic church in the 5th century. If you’re like me and love random information about such things, I’ve a more in-depth explanation of La fête de la Chandeleur – it’s actually the most popular post on my blog ! A typical crêpe pan in a gourmet food shoppe window. Its spiritual roots aside, today la fête de la Chandeleur is a secular holiday – children generally make crêpes at school or will eat them at the cafeteria, and most families prepare a crêpe dinner to enjoy together. Legend has it that if you hold a coin in one hand, and flip your crêpe in the air with the other, you’ll have a prosperous year. Would you like to make some, too ? Well, here we go…(do be careful flipping your crêpes, ok ?). Before I go any further, I’d like to state that I am a vegan, meaning that I don’t consume any animal products for both ethical and general health reasons. Fear not gentle reader! I’m not going to get all vegangelical on you, though if you’d like some hints on vegan baking and cooking (which is probably way easier and more delicious than you can imagine! ), visit the super-cool Alternative Bakers and Cooks in the forums! Here I’ll share a few recipes and serving suggestions, both vegan and omnivore, with you. It’s my intention to be as culturally authentic in my descriptions as possible, and that means proposing serving suggestions with everyone’s lifestyle in mind. Just needed to get that out there. 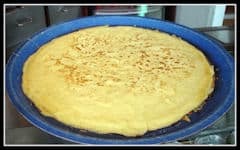 In France, it seems that each family has their own crêpe recipe, in much the same way that most North American households have their « family » recipe for chocolate chip cookies or chili or molé sauce. Growing up, my father’s mouth-watering, Pied Piper-esque, child-hypnotizing recipe for the most coveted oatmeal cookies on the block was actually just the one printed on the Quaker Oats box. Around this same time we had neighbour who categorically refused to divulge her recipe for the chocolate cake she was famous for. I seriously think she scored invitations to picnics and barbecues because her cake was so good. She was inwardly terrified that if people learned that her secret formula was just a « vulgar » Women’s Day no-fail chocolate cake recipe she’d clipped years prior, well, it would make her less important. Balivernes! Hogwash ! 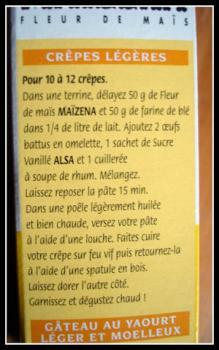 A crêpe recipe printed on a corn starch box. Some people use part flour, part corn starch for their crêpes. They feel it lends them a lighter quality. 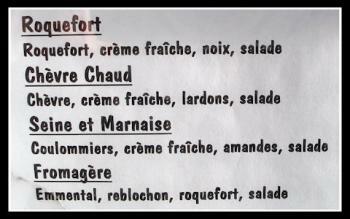 It’s time to de-mystify French cuisine, kids. Things aren’t all that different here – there are indeed crêpe recipes that are handed down de mère en fille (from mother to daughter), but most recipes are very similar, save perhaps an individual’s « secret ingredient » or exact quantities of this or that, and many of these « family » recipes were initially taken from the back of the sugar or cornstarch box. Thanks to the Internet, pretty much anyone can find a great recipe – in any language – with a little Google search. If you’ve never made crêpes before, keep these few hints in mind: 1) be sure your pan is very hot before you pour your batter, otherwise your crêpe will stick to the pan; 2) the first one is nearly always a « tester » so don’t be discouraged if it falls apart on you – just gobble it up and move on to the next one; and 3) you only need a small amount of batter – maybe a few tablespoons or so – lift and rotate your pan to spread the batter evenly over the surface. Also, if you find that your crêpes are too liquid in the pan and you can’t even flip them, just add a little flour and try again. Remember, altitude, weather, and grinding-styles can really play with your flour’s personality! A lovely stack of fresh crêpes. They are larger than a vinyl album, but will be folded into triangles or rolled-up once the filling has been chosen. This recipe is special to me because it’s the first one I ever made – given to me by my host family during my very first visit to France in 1991. * I’ve never tried it, but there are people who use beer rather than rum. They swear that it makes their crêpes even lighter. I’ve never tried it, but if you do, let me know how it goes! What to do: Mix the flour and salt together in a large bowl and make a well in the middle. Whisk in the eggs one by one, then slowly add the milk, still whisking to keep things from getting lumpy. Now add the sugar, and then the rum. Refrigerate your batter for at least an hour, then you’re all set! Keep in mind, these aren’t pancakes we’re making, so your batter will be very liquid. 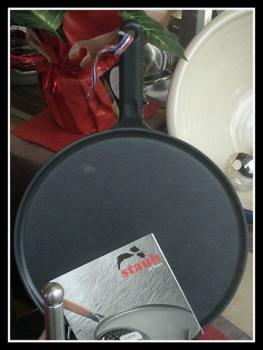 Be sure you’ve got a very hot skillet or super-deluxe non-stick crêpe pan and you’re all set. These savory crêpes make a delectable meal! This is a rather classic recipe that a student gave me years ago at our end of the semester fête. 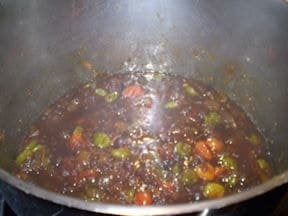 You can find other very similar recipes on-line, but this is a good base. This is also an easy recipe to veganize. Mix the flour and salt together, then whisk in the eggs, and then slowly add the butter and water. Refrigerate at least 2 hours, then get to making yourself some tasty galettes. You can indeed veganize these basic recipes, though I do not suggest using flaxseed as an egg replacer here. While they’ll taste yummy and heck, they’ll be all the healthier for it, you won’t get that lightness were going for with a traditional crêpe. 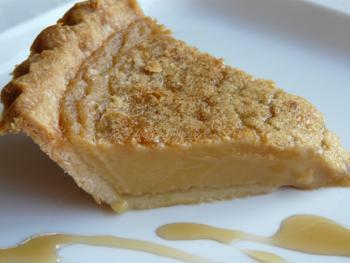 I’ve got my tried & true vegan versions on my blog if you’d like to check it out. Also if you’ve got a great gluten-free version, let me know! That’s one thing I haven’t tried. Bon Appétit! 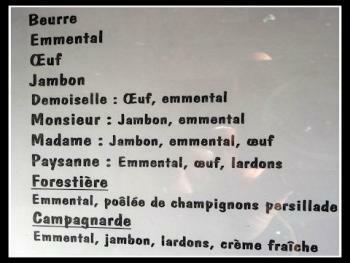 : How to serve your crêpes. Cheese galette offerings from a local crêperie. crêpes are similar to pizza in that there is no limit to the toppings and fillings you can use. Everyone has their favourite version, but here are some of the more classic ways to enjoy them. crêpes and galettes are usually served rolled (with the yummies inside) or folded into triangles with their goodies garnishing the top. Let’s start our dinner with some savory goodness, shall we? You can serve galettes with sautéed mushrooms, sautéed onions, any variety of cheese, sautéed meats, with a dollop of sour cream or a drizzle of bechamel…the possibilities are endless. An example of a rather classic galette would be fried onions, shredded cheese, and diced ham. Another classic example would be sautéed onions and sour cream. My two favourite galette toppings are 1) sautéed onions with shredded, seared seitan and 2) sautéed mushrooms in red wine gravy. If you’re dining in a restaurant, your galette will often be accompanied by a very small green salad topped with a light vinaigrette. 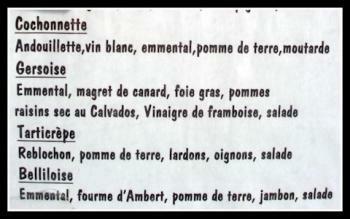 An my house, well, we just put another galette where the salad would be. There are so many possibilities for your dessert crêpes, you’ll run out of room in your tummy before running out of imagination! The most classic of toppings is simply sprinkling granulated sugar on top and rolling it up (both my husband and 3 year-old swear by the crêpe au sucre). Being that I’m so much more sophisticated (ha!) I add a little lemon juice and voilà! You’ve got a crêpe au citron. Many people spread jam or fruit preserves on their crêpes, and still others pledge allegiance to bananas and chocolate syrup. Speaking of chocolate (how did I manage to write so much without talking about our friend chocolat? ), chocolate-hazelnut spreads such as Nutella are also a huge favourite. Oh, and whipped cream. Can’t forget that. You can also add some peach slices and vanilla ice cream to have a crêpe Melba, and let’s not forget les crêpes flambées – Cointreau seems to be the popular choice here. I could go on, but I think you get the idea. Think of crêpes as a blank canvas, just waiting to be decorated by your « sweet » inspiration. There is no more welcome cultural ambassador in the world than food. Political ideals and cultural traditions can find themselves abruptly halted at a country’s geographical border, unable to penetrate. This is hardly the case, however, for the multitude of global culinary traditions that effortlessly travel sans passport. The exotic aromas and tempting textures of « ethnic » or « foreign » food arouse appetites and curiosity across the globe. What better way to bring down the barriers that separate so many, but through the breaking of bread, the sharing of a meal? I believe that highlighting that which unites us – wanting to prepare delicious food from all culinary traditions for our friends and families – is a large part of what being a Daring Baker and Cook is all about. What a wonderful tradition to perpetuate: building the foundations for peace, one crêpe at a time.